Was sich im letzten Jahr so alles ereignete, können Sie dem Bericht unseres 1. 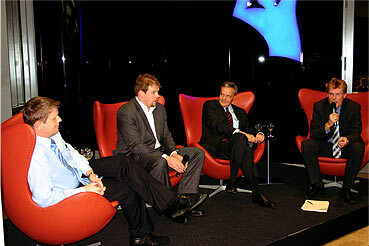 Vorsitzenden, Robert Tonks, anlässlich der Jahreshauptversammlung 2008 entnehmen. We started 2008 with a New Year’s drink on 3 January followed on 19 January by a brilliant panto performance of Aladdin by Millers’ Amateur Dramatic Society who came all the way over to Duisburg from Margate by coach just for the fun of it. Thanks are due to Ian Wright for arranging that again! Our meeting on 7 February marked 55 years of HM Elizabeth II becoming Queen, even though her official coronation did not take place until 2 June 1953. Professor Dr. Ferdinand Urbanek was there to witness the occasion and he came along to show us a selection of slides he took on the streets of London. It was fascinating to see what has not and what has changed. As is their wont, Duisburg University English Thespians (DUET) put on a production at the end of winter term. This time round, it was „Blood Brothers“, by William Russel, on the Duisburg Campus, at SG Aula, on 4 nights from 5 to 8 February. 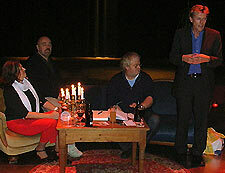 To our regular meeting on Thursday, 6 March numerous people turned up for a chat, keeping the „first-Thursday-in-the-month“ tradition going, against the background that on the next evening, 7 March, we were meeting for a reading of Irish yarns in English with live music featuring Harald Jüngst, which proved to be a huge success thanks to Harald and friends. This was followed by our next regular meeting on 3 April at which Roland Wolf demonstrated Mercator’s Duisburg and how Duisburg, the invention of navigation and the British Empire are connected. At City Palais, Königstraße, Duisburg-Mitte on 8 May, we held our 2nd Duisburg City Talk on the topic of how much enlargement the EU can handle, „Wie viel Erweiterung erträgt die Europäische Union?“. We were greeted by Adolf Sauerland, Oberbürgermeister Duisburg, Brigitte Timmer, Chair, Europa-Union Duisburg-Mülheim-Niederrhein. Those discussing were Dr. Renate Sommer, MEP, Dr. Peter Tibber, British Consul-Genral, Consul Republic of Croatia, Murat Karayalcin, former foreign secretary,Turkey. Robert Tonks, Chair, Deutsch Britische Gesellschaft Duisburg e. V. was the moderator.The event was organised jointly by Amt für Europaangelegenheiten/EUROPE DIRECT EU Bürgerservice Duisburg, Europa Union Duisburg-Mülheim-Niederrhein, Deutsch-Britische Gesellschaft Duisburg e.V., Bund der Kroaten e.V. Duisburg, GAZIANTEP Verein e.V., Forum für Mehr Demokratie e.V. with the financial support of EUROPE DIRECT EU-Bürgerservice der Stadt Duisburg. On 8 May we made an exception and had two parallel events. Across town at Hundertmeister visitors from Portsmouth - over for week’s break - popped by for a chat. Our first bbq in 2008 was on 5 June. Also, Klaus Barbian showed us his England in the form of slides taken over the years in Durham. Proving he feels as at home in Durham as he does in Duisburg, he provided us with a both interesting and witty insight into what makes the Geordies tick. Thanks are due to the Hundertmeister crew for another excellent bbq. Read the last sentence out loud – it rhymes. On 3 July we went on a virtual journey – by means of a short documentary film - to South Wales, stopping off at one of the many castles along the Welsh Marches, at Caldicot. This was followed by a film-trip to the Exe Valley. Both films were made by Bob Heard from Newport. Thanks Hundertmeister crew for another excellent bbq. Two promising young local Duisburg talents, Bianco Schwichtenberg and Friederike Van der Sand, gave us a high-class, unplugged performance from their broad repertoire of contemporary songs for singer/guitar on 7 August. Watch out for them. On 4 September, Günter Reichwein, Duisburg’s interpreter and guide, who has accompanied - and shaped - the links with Duisburg's twin city Portsmouth for decades, gave us an exclusive presentation on "Twinning links with Portsmouth". This link will be celebrating its 60th anniversary in 2010. Günter, who was recently honoured by Portsmouth for his achievements, elaborated on present-day contacts and what the city looks like today. We hosted a Sedgefield Borough Civic Delegation at Hundertmeister on 6 September. Bob Clark had a great time rubbing shoulders with people speaking the same accent as he does. At Burg Linn in Krefeld on 13 September, twenty members and friends of the German British Club Duisburg joined 1000 enthusiasts of the Last Night at the Proms for an unforgettable evening. 28 October : Stacy Blatt gave us a talk on "Democracy in America - How does it work (and not work) ? How will it effect the 2008 presidential election ?" She asked questions such as: How can a system created over 200 years in the days of the pony express function in the age of the internet? It was indeed a well-timed talk about the history and workings of the U.S. electoral system. 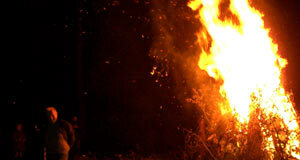 "Remember remember": our Bonfire get-together at "Freie Schwimmer" in Wedau, on 14 November was attended this year by 30 Guy Fawkes Fans. Robert Tonks gave a talk on Anglicisms in German at Duisburg Volkshochschule on 18 November "Deutschland in Pool (!?!) Position – The German language in structural transformation at business locations across Germany". 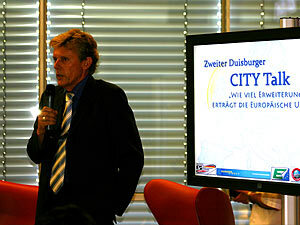 Our third Duisburg CITY Talk on „Quo Vadis Europe?” took place at City Palais on 4 December. We were greeted by Adolf Sauerland, Oberbürgermeister Duisburg, Brigitte Timmer, Chair Europa Union Duisburg-Mülheim-Niederrhein. The discussants were Dr. Christoph Konrad, EVP-ED, MEP, Richard Stock, Director, Centre Européen Robert Schuman, France, Prof. Dr. Henri Ménudier, Université Sorbonne Nouvelle / France, Tomás Sharkey, Candidate for Sinn Féin in East Ireland at forthcoming European Elections, James Candon, Counsel Internet Security Systems IBM, Brussels, Dr. Jaroslav Šonka, Director of Studies, Europäische Akademie, Berlin / Czech Republic. Wolfgang Schwarzer / Deutsch-Französische Gesellschaft Duisburg e.V. und Robert Tonks / Deutsch Britische Gesellschaft Duisburg e.V. moderated the debate. The event was organised jointly by Amt für Europaangelegenheiten/EUROPE DIRECT EU-Bürgerservice Duisburg, Europa Union Duisburg-Mülheim-Niederrhein, Deutsch Britische Gesellschaft Duisburg e.V., Bund der Kroaten e.V. Duisburg, GAZIANTEP Verein e.V., Forum für Mehr Demokratie e.V. with the financial support of EUROPE DIRECT EU-Bürgerservice der Stadt Duisburg.